Graham and Laura waved them off, calling out, take care, drive safely. Tanya nodded, giving them a wry smile and said, of course she’d drive safely. Tanya hated driving home late at night in the dark. Her boyfriend persuaded her it was her turn to drive so she drank lemonade and water. It was a 40 minute drive back to their place and the weather was closing in. The clouds scudded across the bright moon, darkening the night, the wind picked up as she turned the key in the ignition. The small, low-slung sports car started up with its unique rumble. She felt the throb of the engine through her feet resting lightly on the pedals, up through her bottom sitting on the hard bucket seat, supposedly the best seating for this type of sports car, not for her bony bum though. The vibration travelled up her body, down her arms reaching her fingertips gripping the steering wheel tightly. She tried to relax as she let go of the clutch and slowly drove out their friends’ driveway. Within minutes her boyfriend, Ben, was asleep, snoring his head off. A few beers did that to him. She wasn’t a very confident driver, add in darkness, a storm, thunder and lightning and she was a nervous wreck. Shaking her head Tanya steeled herself for the drive home. He must trust her driving ability to fall asleep like that. No, it was an alcoholic stupor he was in. She jumped out of her seat as a clap of thunder reverberated through the car. Her heart was beating nineteen to the dozen, her grip on the steering wheel tightened, her knuckles white with the effort of controlling the car. Relax, relax, relax. There’s nothing to be afraid of, it’s just a storm. Yeah, just a storm at nearly midnight on Halloween. Up ahead she could see red brake lights, thank goodness there was another car on the road. It was so eerie when she couldn't see anyone else about. She pressed down on the accelerator, keeping an eye on the speedometer as the needle climbed steadily up. The engine began to whine, she eased off the pedal, checked the gear stick, yep, she was in the right gear. She looked at the road and couldn't see anything in front of her as the rain pelted down. The windscreen wipers were going at full blast, barely clearing a space for her to peer out of. Relax, Tanya, it’s just a storm. She could have sworn it was her father’s voice in her mind. That film they’d watched at their friends’ house was playing on her mind. ‘An American Werewolf in London.’ Not a lot of plot but she was jumping all over the place at the scary bits as Graham and Ben laughed at her reactions. Laura didn’t seem to mind the film, so Tanya went with it. Approaching the crossroads she struggled to remember which turn to take, left or right. She shook Ben’s leg and shook him again. ‘Which way, Ben?’ No response. She screamed as she shook him again. ‘Which way?’ Tears threatened to fall from her eyes as he slowly came to. He took in their surroundings, pointed left before he slumped and started snoring again. She would not forget this night in a hurry. Oh, thank goodness, a main road at last with some street lighting. Just as Tanya relaxed a bit, bright lightning lit up the sky in front of her. Blinding her with its intensity it forked across the road showing up the shadows in the hedgerow, she could have sworn there were figures there waiting to jump out at the car and claw their way through the soft top vinyl covering. Relax duck, relax and concentrate on your driving. There was her dad’s voice again. Oh, she wished he was here. He wouldn't have fallen asleep as a passenger. It was so rude of her boyfriend. Maybe Ben wouldn't last much longer. It depends on how he treated her after this. Now the storm moved to the side and followed her. It shadowed the car. It kept parallel to their route. She could see it in her peripheral vision. She looked to her left, past the snoring profile of the man sitting beside her, the thunder bellowed its power at her, mocking her for looking at it. The forked lightning struck the hillside, lighting up the fields below, an eerie white light suffused her vision. She tried to control the car as her trembling limbs juddered on the accelerator. Her hands tensed on the wheel. They tyres seemed to lose their grip on the road, she steered round a blind bend, just missing a lamp post on the side of the road. The pavement reared up to meet them, she bumped over the kerb and managed to manoeuvre the car back on to the roadway. That was a close call. The car stopped. She had to get going again. The lashing rain took that moment to lessen to a drizzle and then petered out completely. Tanya looked in the rear view mirror, it was pitch black behind her, the street lights had gone out. She looked ahead as she slowly edged forward again. The moonlight lit up the road, the clouds had gone, the lunar glow shone clearly on the road ahead which was dry as a bone, as though the storm hadn't reached this part of the route. Well done, darling, well done. She parked outside their house, breathing sighs of relief. Ben woke up, stumbled out of the car barely waiting for her to lock the vehicle and open the door with her key. He stumbled to the sofa and instantly started snoring again. She couldn't believe what had just happened. OK so it was Halloween. Did that really make such a difference? One thing she knew, she would never drive home late at night during a storm on 31st October ever again. You had it all! Every player was there for a horror fest, but so was the voice of an angel. A lovely addition and a great story. 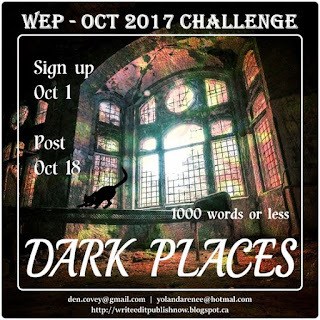 Thanks, Sally, for participating in the WEP Halloween Challenge! How I love that she was protected. And suspect the protection would tell her to kick Ben to the curb. So descriptive, I felt her fear all the say through. Well done! Very atmospheric and spooky. Great tension. Kudos! I could relate to driving through a storm and how scary it can be. Glad it all came out well in the end. That was one scary drive. I'm glad she was OK at the end of it. When he woke up the next morning, his clothes would be packed and waiting at the door! I am happy that she got through it okay. Your descriptions are good. They led me into the story. I had to smile since I know a few timid drivers. In Colorado we have summer storms that we call, 'Little Mountain Showers.' They literally last a few minutes and one side of the road could be receiving a down pour while the other side is in sunshine and on dry pavement. But, never on Halloween after midnight in the dark. That would be spooky. Time for your heroine to kick the boyfriend out. Well done. Hi Sally. Sorry it took me so long to drag my jet lagged body over your way. I read this story as soon as you posted it, but waited until I made sense before attempting to comment. I think many people share Tanya's fears of driving through storms and generally bad weather. I felt her fear and her anger at her boyfriend. You expressed it so well. Thanks for joining us for the WEP challenge. You always come up with something a little different. I like to think that the voice in the head is a guardian, gone before us, who tries to guide us safely. I hate driving at night on a lonely road, too, and even more so when its raining. Thanks for the chilling tale! I have missed your stories. This story shows why!